FRANCHON CREWS DEZURN DISCUSSES HER TITLE WIN, FUTURE PLANS, AND MORE: "THIS IS MY TIME...I'M READY FOR WHATEVER"
"I’m going to enjoy my time. This is my time and I’m focusing on developing more as a fighter. I’m used to being at the top, so I’m ready for whatever. I have a great team and I’m ready for whatever...For me, I would love to fight in December. Glen is working hard towards December. 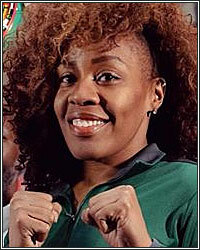 He’s sparring again, so it would be wonderful if we both could come back in December," stated newly crowned WBC super middleweight champion Franchon Crews Dezurn, who talked about her recent win over Maricela Cornejo, her future plans, and much more. Check it out! PC: Congratulations on capturing the WBC title with your win against Maricela Cornejo. FCD: Thank you so much. PC: How do you feel about the performance? FCD: I’m glad I got the mission accomplished. There is always room for improvement. It was a big stage for me because I never done 10 rounds before. I was pleased with my endurance; I just have to be a little more discipline, be sharper, and listen to my corner. Overall, I’m happy. PC: What is it like going 10 rounds for the first time? What did you learn about yourself in those championship rounds? FCD: What’s crazy is, I realize…I don’t want to say I’m a slow starter, but I do get stronger as the rounds go on. I know I’m a strong finisher. PC: Do you feel like that is something you need to work on or do you just have to bring these women into the deep waters and see if they could swim? FCD: I’m adaptable. I have stopped girls within 20 seconds of the first round. I can do it all. I just do whatever needs to be done to get the fight done. If I feel like I can stop her early, the killer instincts will kick in and I will jump on her, but I’m always going to prepare to go the full distance of the fight and more. PC: Was Cornejo what you expected her to be? FCD: Out of all due respect, I’ve been around a long time. I’ve always competed at the highest level with girls from different countries. I give her just due that she did last longer than I thought she would. She was in shape. I don’t know… she was a good fighter. She was a good experience to be in there with. PC: Two judges had the score 99-91 and then you had a 95-95 score. I’m sure you were livid at the draw scorecard; luckily it didn’t negatively affect the outcome. FCD: I’ll let Glen answer that because I think I kind of blacked out (laughing). I was like, “Okay, the fights over; my life is about to change.” I kept looking at Glen, so he could answer better than me. Glen Dezurn: I mean, with the scorecards, boxing has it’s dark and bright moments. Everybody who knows boxing knows that that was total bs. Everybody that knows boxing for what it is knows there is politics sometimes. So for these fights, we prepare for everything; physically, mentally, the ups and downs. So regardless of how the scorecards would have played out, she would have left the ring still a champion. In this case, she left as the physical champion because there wasn’t a way around it. FCD: I think a lot of people try to criticize me for the fight with Claressa. Real boxers know that fight was not a unanimous decision. I would have been comfortable with a draw; even a split. I was out there giving my all, so when they read the scores, I’m like, okay, I have been through the bs and it’s going to be what it’s going to be, but I’m just happy they got it right. PC: She has sense said she’s moving down in weight. Do you feel this is a good move or the right move for her? FCD: Well, you know, I’m very cordial with the other female boxers, even if we are not best friends. I try to be respectful. But I’m not happy with the fact that she tried to fat-shame me. When we made weight, we made weight. We both were within the limits. There has been fights where she was the smaller fighter. She is actually bigger than me. She’s actually 5’10" and to use weight as an excuse was a little offensive. But the game is changing and there are a lot of talented females out there, so I feel like if she moves down, she is going to have even more problems. PC: Women’s boxing is as popular now as it was during the Laila Ali, Christy Martin, and Ann Wolfe run. I’m sure these are exciting times for you and I’m also sure you know that these women will be gunning for that title. FCD: (Laughing) You know what? I haven’t even been a world champion for a whole month and with the recent news of Christina Hammer and Claressa [Shields] falling out, I have already gotten a call, but you know what, I’m going to enjoy my time. This is my time and I’m focusing on developing more as a fighter. I’m used to being at the top, so I’m ready for whatever. I have a great team and I’m ready for whatever. PC: Since making your pro debut against Shields in a great fight, you have won four consecutive fights. Did you do something different or is it a matter of just growing as a fighter? FCD: I would credit it to not being a quitter. Even though there were times where I wanted to stop, not even from fighting, just the bs that comes with the business, I was feeling like I’m not respected. I would credit it to just not giving up and the support of my husband and my team. My coaching staff, my family down in D.C., and just a couple of people that I check in with and they keep me grounded. It’s a small but mighty circle. Usually if I say I’m going to do something, I usually stick it out no matter what. PC: I’m sure that it is a double-edged sword being married to a fighter [Glen Dezurn] because of the highs and lows this sport can bring. Can you elaborate on what it’s like? FCD: I think that, especially for this lifestyle of boxing that is really difficult, it’s really trying both physically and mentally. But I feel like one of the luckiest girls in the world because I can tell him my inner fears and I can tell him when something doesn’t feel right. He knows when something isn’t right and vice versa. I think we push each other, especially with me getting this belt. It’s going to encourage him to keep going. Our road has been long and tough, but we are coming closer to our goals. It’s like we become one person. When I’m fighting, you will see Glen talk more than he ever talks in like a whole week. And when he’s fighting, I’m at the edge of my seat and I take all of his anxiety. I feel very blessed to have someone to share my journey with. PC: Glen, could I get your thoughts on what it’s like being married to a fighter as well? GD: Man, it’s really hard to explain. You have to be a fighter to really understand our relationship. Being married to a fighter…we are in a lonely sport where people can criticize and not understand what it’s like and what we go through from top to bottom. Be mindful that a lot of these people that criticize make excuses of why they couldn’t make it as a fighter. They wasn’t built for their dream. They didn’t have the endurance to endure the ups and downs. Being a couple and being married as a family of fighters, we understand each other because we know how lonely the sport can be and we know how bright the sport can be. We have no secrets in our marriage. I can’t really explain it. PC: Would you guys want your children being active in the sport of boxing or would you try to keep them away? FCD: We’ve had conversations about that. I think we will definitely raise our children to be able to defend themselves, but I would love to be able to encourage my children to do whatever they want to do as long as it’s not detrimental to them or their health or anybody else. I just want to support them because me personally, the only support I had was my godfather, my mom, and then when I met Glen. I actually had my brother tell me to get a real job. We were homeless for a moment and my brother was like, “Get a real job,” and I was like, “Boxing is my job.” This was a time when I was on Team USA. I was getting paid stipends; it wasn’t a lot and I decided to go pro. So when he said, "get a real job," that just stuck with me because boxing is life. It is a job to me and it’s something that I love to do. So whatever our children decide they want to do, we just want to support them and try to guide them in whatever way that we can. PC: What’s a realistic return time for both of you? FCD: For me, I would love to fight in December. Glen is working hard towards December. He’s sparring again, so it would be wonderful if we both could come back in December. PC: I appreciate both of you guys’ time, best of luck, and hopefully we will see you both back in the ring in December. Is there anything else you want to add? FCD: Just make sure you watch out for Team Dezurn and continue to follow us. Head Bangers is making moves as well and I appreciate all the support. It’s an honor to do an interview with you.